Monogrammed little boy ties....perfect for pictures! 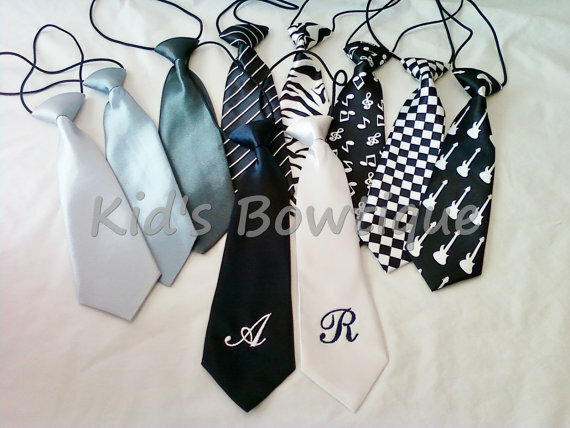 Kid's Bowtique has ties that are perfect for little boys to wear for pictures, wedding attire, etc. A ring bearer would look sharp wearing a tie personalized just for him! Pick your tie color and monogram letter. We can monogram a letter in any color that you choose. Each tie is approx. 11 inches long. Light silver, Silver, Dark grey, Black/white Pinstripe, Zebra, Music Notes, Checkered Flag, Guitars, Dark Navy, and White. NOTE: Price is for one tie.